After an early breakfast, we threw all our belongings into the car and headed out of town around 9am. 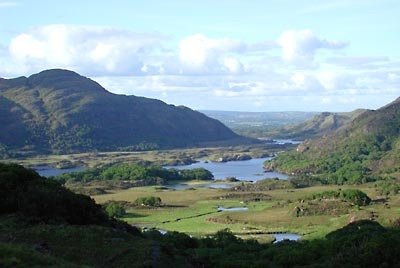 Our goal for the day was to at least make it to Killarney in County Cork, some 350 miles from Portrush. We took the A2/A37 to Londonderry. While I had not picked up any signs of the Troubles in Portrush, there were plenty of British soldiers on patrol in Londonderry. The police stations or army barracks with their fortified towers looked slightly disturbing. The whole scene was not something I would generally expect to see in a EU country. We turned south onto the A5 and crossed the border into the Republic of Ireland in Strabane/Lifford. The Gardai (police force of the Republic of Ireland) had set up a check point at the border, stopping every vehicle to inquire about meat or dairy products and all cars had to go throug an automated disinfectant shower, all in an attempt to keep foot and mouth disease out of the country. We followed the N15 via Donegal and made our first stop for the day in Drumcliff, a few miles north of Sligo. 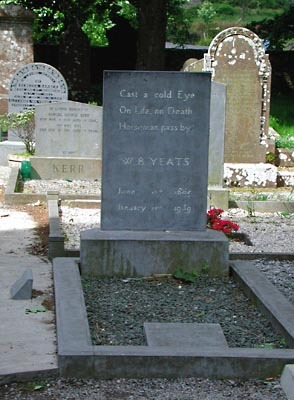 W. B. Yeats, one of Ireland’s most famous poets was buried in the graveyard of the protestant church. 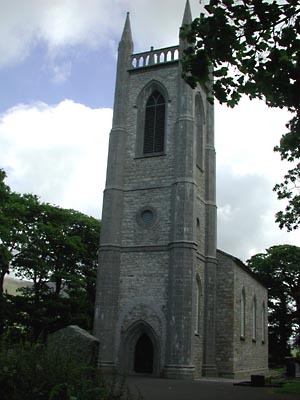 In Sligo, we continued on the N17 to Galway where we turned onto the N18 to Limerick. I took the following panaramo shots at a parking place on the N21 somewhere south-west of Limerick (IIRC). Click on the picture for the complete panorama (3200*400. 260kB). Note: For some reason, MSIE5 for Mac OS refuses to display the whole picture. At about 10:30pm, we signed up for a room at the Ivanhoe B&B in Skibbereen. The room and breakfast were okay and the price was right, but I saw a for-sale ad for the house in an estate agent’s window down the street, so I guess the B&B may not neccessarily be around much longer.